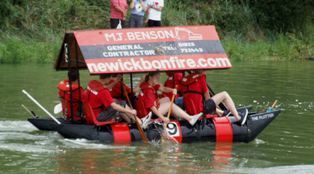 Newick Bonfire Society improved on last years finish by coming a very respectable 3rd place on Sunday 17th August in this years Lewes to Newhaven Raft Race on their homebuilt raft "The Plotter". Due to a brisk headwind the team completed the race in a slower time of 2 hours 34 mins battling against the severe elements (mostly eggs, flour, mud and porridge) sent from above, however the raft (and team) recieved a good wash down by the crew of a dredger moored in Newhaven Harbour just prior to the finish line. The team have raised �780 for the RNLI. Special thank you to the main raft sponsors Gus Ross & Family and M J Benson General Contractor, also a big thanks to the support team Martin Benson and Julian Avis, Lewes Round Table for organising the event and to everybody who sponsored and supported us on the day.